Parenting and controlling screen time go hand in hand if you have a teenager these days. The fact is, young millennials and generation Z were born into the instantly accessible world of laptops, tablets, and smartphones to the point that many toddlers know how to work digital devices better than their parents. With the constant use of technology spread out between entertainment, education, and socializing with friends, teens are on tech devices now more than ever. Reports indicate that Canadian teens spend an average of eight hours in front of a screen per day. In a national survey of 52,000 Canadian kids between Grades 6 and 12, more than 50% get more than two hours of screen time each day. Boys averaged slightly more screen time at 8.3 hours per day, while girls found themselves focused on screens for 7.3 hours. That’s a lot of hours, considering the recommended national guidelines for the amount of screen time for children aged between 5 and 17 is two hours per day. Even if excessive screen time may not be the root cause of severe eye-related complications, it can put pressure on a teen’s growing eyes. Read on to find out how your teen’s eyes could be affected. Refractive errors are common among teens who dedicate a lot of time to device use. Although 60% of refractive errors or nearsightedness, also known as myopia, are caused by hereditary factors, recent studies have shown that prolonged hours of device usage worsen nearsightedness. Viewing a screen for long periods of time or holding a small device close to your eyes can cause your teen to experience a tension headache. Quite common amongst people of all ages, the headache is your body’s response to stress on the eyes. Hectic lifestyles and stress are also commonly associated with headaches. A “new age” disease, CVS affects teens and middle-aged computer users who work for long hours in front of a computer screen. Symptoms include eye irritation, blurred vision, head and neck pain, as well as dry eyes caused by reduced blinking. Liquid crystal displays (LCD) and light-emitting diode (LED) displays frequently found in computer monitors, tablets, TVs, and mobile phones emit diodes of blue light that make it difficult for your eyes to focus. Muscles inside your eyes change shape when you attempt to focus. When you stare at a single point for a long time, those muscles start to weaken. In extreme cases, eye muscles can become so tired they are no longer able to focus. Other complications linked to excessive screen time are teen obesity and poor posture. Stand your ground when it comes to enforcing screen time limitations. This should include computer work for school and any toy gadgets involving a screen. 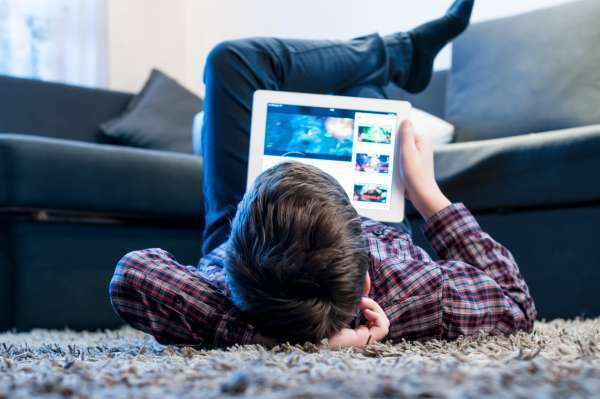 Keep an eye on content your teen is absorbing to avoid wasted screen time. Encourage proper ergonomics for your child, and educate them on the importance of it. Anti-glare glasses may be an option if computer/screen work cannot be avoided. Regular eye exams will help discover any refractive errors or other eye problems, so keep up to date on your teen’s appointments. If you observe any of these symptoms in your teen, consider making an appointment at your local FYidoctors clinic. Our eye care professionals can offer personalized advice to prevent the long-term negative effects of digital device use.